Lush – with Elastica’s Justin Welch on drums – will reunite to play London’s Roundhouse on 6 & 7th of May 2016. Miki Berenyi says, “For 20 years it was an impossible undertaking, but we all loved what we did, and the time is finally right.” 4AD’s recent vinyl reissue of Lush’s Best Of, Ciao!, will be followed by a box set, Chorus, in December. The results are in! 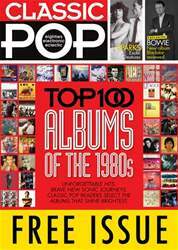 The latest issue features the Classic Pop 'Top 100 Albums of the Eighties' - as decided by our readers - including the classics of the decade, some cult favourites and a few wildcards to boot. PLUS! We give the Classic Pop verdict on David Bowie's new album 'Blackstar'… Elsewhere in the issue we investigate the classic pop of Christmas, delve into Sparks' weird and wonderful back catalogue, survey Simple Mind's classic album 'Once Upon A Time' and take a closer look at the leftfield sleeve art of John Foxx. Interviews include Visage's Steve Barnacle, Chris Difford and Glenn Tilbrook of Squeeze, Susanna Hoffs, McAlmont & Butler and modern synthpop duo Hurts.